This is my very Zen tomato soup: simple, unadorned and, for those of us brought up on the tinned variety, enlightening. It’s the real deal. There was a time when I would sweat a vat of tomatoes for hours in pursuit of their essence. Later I overloaded and overwhelmed them with a dozen other flavours. No more: the combination of slow-roasted tomatoes and naked garlic cloves hits exactly the notes I am looking for, sweet and fresh. I've specified Roma or plum tomatoes for two reasons: fewer seeds, more flavour. Round tomatoes are being bred to survive travel more than they are to be eaten – the interiors of some have the consistency (and taste) of polystyrene. If you have a trusted source of tasty round tomatoes, go with those. Otherwise, I've found, Romas are a safer bet. Eight cloves of garlic sounds like a lot, I know – and it is a lot – but you have to trust me that roasting them on top of the tomatoes takes away all their pungent power and bite, leaving only a creamy sweetness that brings depth to the soup. I’m not going to tell you how to eat soup. If you like to swirl in sour cream or scatter over crackers or croutons, do that. The tomato’s best friend, basil, is good here, either as roughly torn fresh leaves or a dollop of pesto. I prefer it uncluttered, although good bread will always be close at hand. Set your oven to 150°C (300°F). 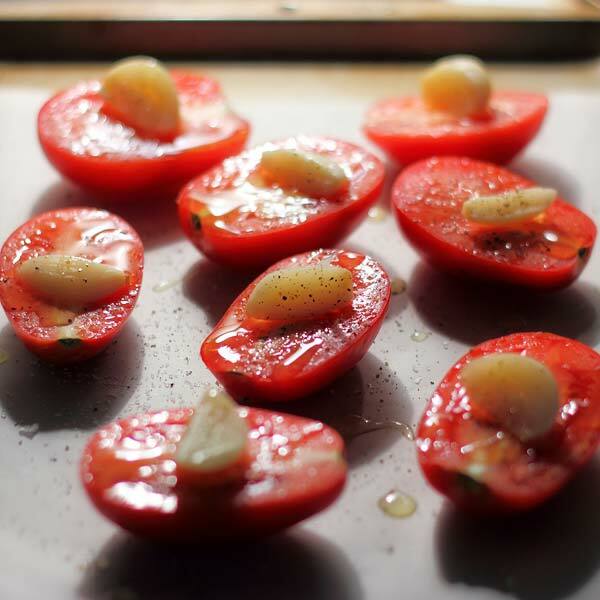 Slice the tomatoes in half, lengthways, and put them cut-side up on a baking tray. Cut the garlic cloves in half, lengthways, and place one on each piece of tomato. Drizzle the olive oil over and sprinkle over the sugar, then season with salt and pepper. Put the tray into the oven and roast for 1 hour. When they’re done, remove from the oven and set aside to cool a little. Meanwhile, you can put the stock in a small saucepan over low heat to start warming through. Put the tomatoes and garlic, as well as any juice that has collected on the baking tray, into a food processor or blender and puree until smooth. Pour this mixture into the warm stock and stir together over medium heat until it reaches a bubble. Taste and adjust, seasoning with salt and pepper.